A loan of $100 is all it took for James T. Williams to open a grocery store in Minneapolis in 1896. But this businessman's legacy would not be in the goods he sold but the product he developed in 1912. Williams redesigned elbow macaroni with a thinner wall and larger hole and, as a result, invented the first quick-cooking pasta. 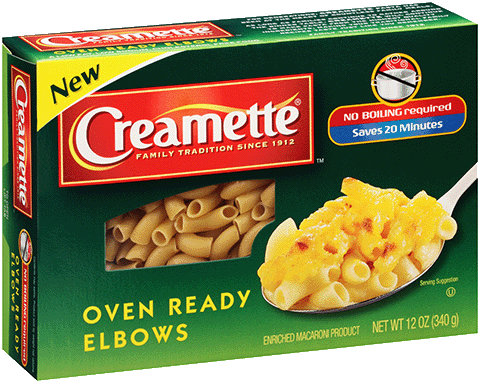 Williams named his macaroni Creamette®. The Minnesota Macaroni Company manufactured the Creamette® brand until Williams bought out the firm and Creamette® became its official new name. The history of innovation that Williams employed to create his fast-cooking noodles was indicative of the spirit that propelled Creamette® to a leading share position throughout much of the Midwest. In the 1950s, consumers came to know Creamette® as the "recipe company" for the easy recipes listed on every box. Creamette® has grown from a regional brand popular across the Midwest to a regional favorite. It's widely distributed in 37 states through the U.S. Creamette® was run by the Williams family until 1979 when it was sold to the Borden dairy Company®. Creamette® is part of the Riviana Foods Inc. portfolio of pasta and rice brands. With pasta meal solutions for every taste and diet, we have something for your whole family. Enjoy the adventure and get creative! In addition to classic white pasta, we also produce: gluten-free pasta, organic pasta, whole wheat pasta, noodles, high fiber pasta, veggie pasta, ancient grains pasta and reduced calorie pasta. Our principal pasta brands include: American Beauty®, Light 'n Fluffy®, Mrs. Weiss®, No Yolks®, Prince®, Ronzoni®, San Giorgio®, Skinner® and Wacky Mac®.